HomeTemperature Alarm ReviewsWhat Freeze Alarm should I buy for my home or vacation property? What Freeze Alarm should I buy for my home or vacation property? Probably the Freeze Alarm Intermediate, it is by far our most popular Freeze Alarm dialer. It is programmable so the user selects the low temperature threshold and programs in three telephone numbers for the device to call if the temperature falls below that set point. For most home or vacation home owners the FAI-CCA Intermediate is the Freeze Alarm they will choose to install. It requires a phone line to operate (either a traditional Landline, or a cellular phone line provided by the Globe Surfer). The TempSpot is a new and very popular Freeze Alarm for your property. Any home owner with WiFi could choose to use the TempSpot as it does not require a phone line to operate. Again, you can program in your high and low temperature thresholds. Than the TempSpot will monitor the temperature in its location and automatically update your free cloud account with the current temperature once every two hours. The TempSpot is also ALWAYS monitoring the temperature, so as soon as the temperature exceeds either of your thresholds the TempSpot will connect to the cloud and trigger an alarm event so the appropriate user receives a text message and email alert notifying them there is a problem. 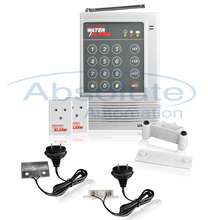 We have many other freeze and temperature alarm devices available from very basic devices which are preset and unchangeable to complex and expandable alarm systems. However, for 90% of our vacation home or snow bird customers one of the above two devices will do the trick for them. It’s Freeze Alarm Season Again!